Finest quality grains provider | WEST GRAINS INC.
West Grains Trading is committed to supplying only the finest quality agriculture products from the vast farm regions of Northern and Southern Luzon. Its head office is strategically located in Bulacan, one of the provinces in the region that is called the Rice Granary of the Philippines, which at the same time is a very strategic source of agri-products in South East Asia. The abundance of land in this province is key component in the production of a vast array of fresh raw materials for feed producers, livestock and poultry industries in Bulacan, Pampanga, Cavite and Laguna. 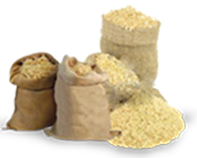 West Grains provides the following products: Rice Bran D1, Rice Bran D2, Wheat Bran or Wheat Pollard, Copra Cake Meal, Fine Ground Corn, Soy Bean Meal, Cassava Meal and Pellet, Corn Bran, and Molasses. We have long history of partnership with the country’s biggest rice mills, oil mills, flour mills, as well as other agriculture products trader.